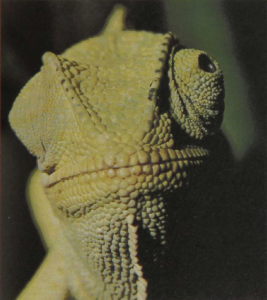 This south Mediterranean species is a typical representative of a group of lizards that ranges into south central Asia and across Africa to the Cape of Good Hope. 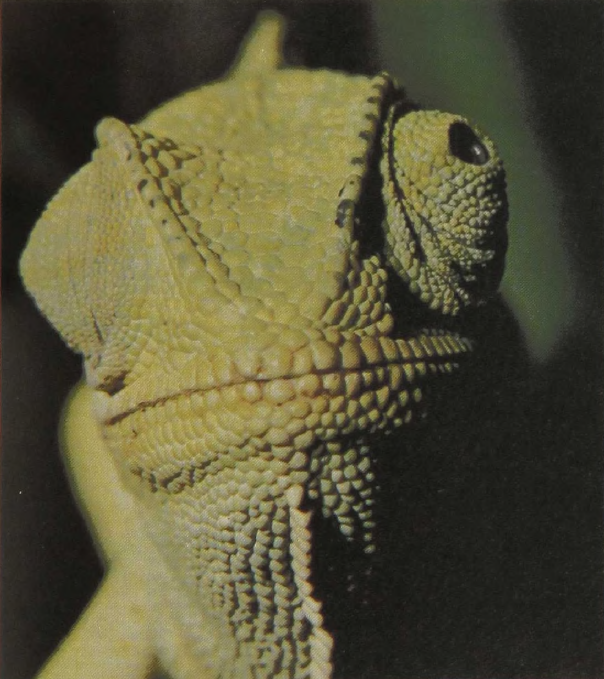 Derived from agam ids, chameleons have become specialized for living in trees. Both hands and feet have opposed fingers and toes, letting them grasp narrow twigs. The body, from 8 to 1 0 inches long, is flattened and the tail prehensile, promoting stability when the wind ruffles bushes and trees. Color-change mechanisms in the skin of some species match the surface appearance to that of the surroundings by changing from brownish to greenish hues. Most remarkable is the feeding method. The tongue can be projected as far as a full body’s length and then pulled back, carrying insects trapped on its sticky tip.